Product prices and availability are accurate as of 2019-04-18 20:51:11 UTC and are subject to change. Any price and availability information displayed on http://www.amazon.com/ at the time of purchase will apply to the purchase of this product. Built like the Ultimate Knife, this non-serrated version has a fine edge from the tip of the blade to the top of the handle. Using the same high carbon, stainless steel drop point blade and texturized rubber handle this is equally tough and unmistakably Bear-inspired. Housed in a nylon and hard rubber military-grade sheath, a fire starter, a diamond knife sharpener and survival guide are all integrated. The lanyard cord contains an emergency whistle. The Ultimate Knife (both serrated and fine edge) is the pinnacle of Bear's signature line. 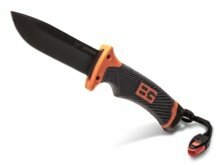 Tackle general cutting tasks with ease using the Bear Grylls Ultimate Knife from Gerber. 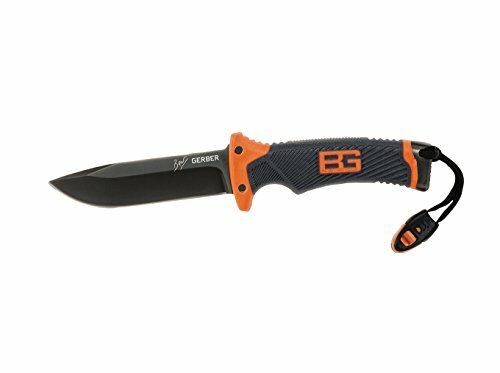 A signature product in Gerber's Bear Grylls line of survival gear, this rugged utility knife features a fixed, drop point, fine-edge blade made of high-carbon stainless steel. The textured handle offers a comfortable grip, and the military-grade sheath contains a diamond knife sharpener. This fine-edge utility knife is handy for general cutting tasks (view larger). A military-grade rubber sheath keeps the knife secure (view larger). Included is an integrated diamond knife sharpener (view larger). Like the serrated version of Gerber's Ultimate Knife, this utility knife is equipped with a fixed, drop point blade made of high-carbon stainless steel. 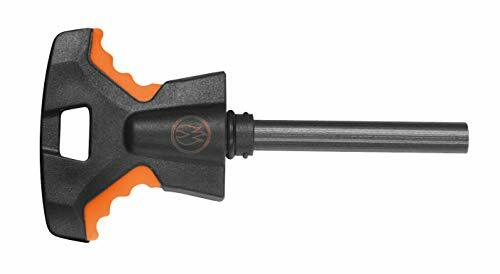 A textured rubber handle offers a secure grip. The knife also sports a lanyard with an emergency whistle. This utility knife comes housed in a nylon and hard rubber military-grade sheath for secure storage and transport. Integrated into the sheath are a diamond knife sharpener and a fire starter along with a Bear Grylls "Priorities of Survival" pocket guide. 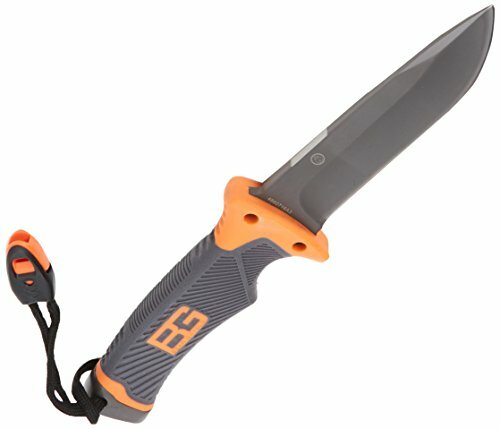 The Bear Grylls Ultimate Knife has a 4.8-inch blade, measures 10 inches long overall, weighs 11.2 ounces (14 ounces in the sheath), and is made of 7Cr17Mov stainless steel. Together with Bear Grylls, Gerber makes survival tools for everyone from scouts on their first overnighter to seasoned adventurers exploring the backcountry. For survival in the elements, Gerber created a line of the toughest, most innovative knives and tools available. With just your hands, your head, and your tools, you can account for everything needed to stay alive in the wild. When Joseph R. Gerber described his young knife company, Gerber Legendary Blades, as the "birth of an enterprise that grew into big business," it was true, but it was an understatement for sure. What had started out in 1939 as a small batch of handmade cutlery sets given as holiday gifts had turned into thousands of retail accounts around the country. By 1960, Gerber had quickly become one of the most trusted, appreciated and collected names in knives. After more than 70 years since its founding, Gerber continues to grow. Still grounded in the same principles that first guided Joseph R. Gerber's "enterprise," Gerber is a company dedicated to making knives and tools that combine high-quality materials and innovative designs that will stand up to a lifetime of use. The sleek, stainless steel sheath knives of the '50s and '60s (the Magnum Hunter) have given birth to today's lightweight, open-frame clip folders (the Remix). Gerber is, however, no longer just a knife company. Multi-tools, axes, handsaws, machetes, headlamps, flashlights, survival kits, digging implements--these are the newest directions that Gerber explores with the same standards of quality and design that inform their revered knife making. One Bear Grylls Ultimate Knife with a fine edge, one sheath, one knife sharpener, one emergency whistle, and one Bear Grylls "Priorities of Survival" pocket guide.